TeslaCrypt Ransomware (also known as CryptoLocker-v3) is a serious infection that might enter your system without your permission and encrypt files with such extensions as .pptm, .xlsm, .docx, .unity3d, .jpeg, .blob, .rofl, and many others. Researchers working at pcthreat.com have found out that TeslaCrypt Ransomware encrypts many files that belong to different games, so if it happens that you cannot open documents, photos, and games, it is very likely that TeslaCrypt Ransomware has managed to enter your system. Of course, there are many other symptoms that this ransomware infection is present. In order to get more information about it and find out how to remove it, you should definitely read through this article. After that, you can freely use our instructions that will help you to remove TeslaCrypt Ransomware from the system; however, you should know that you will not be able to access your files even if you remove this threat. It has been found out that TeslaCrypt Ransomware will not only encrypt different kinds of files, but will also change your wallpaper and display a warning. What is more, you will notice that .ecc extension has been added to each of the encrypted files. These symptoms will disappear if you remove this threat. If you have already noticed the changes on your desktop and see such or a similar text (see below), there is no doubt that TeslaCrypt Ransomware has infiltrated into your system. Make sure that you remove it as soon as possible because it will start with Windows every time. The main reason why TeslaCrypt Ransomware encrypts files is to extort money from computer users. Thus, it is not surprising that this infection will ask you to pay a particular amount of money in Bitcoins. In fact, a user will have to do that within the stated time if he/she does not want the private key, which can be used to decrypt files, to be destroyed. Even though it might seem that the easiest way is to make a payment, we definitely not recommend doing that because it is unknown whether you will receive the encryption key. Do not worry; you will be able to recover your files very easily if you have a backup. 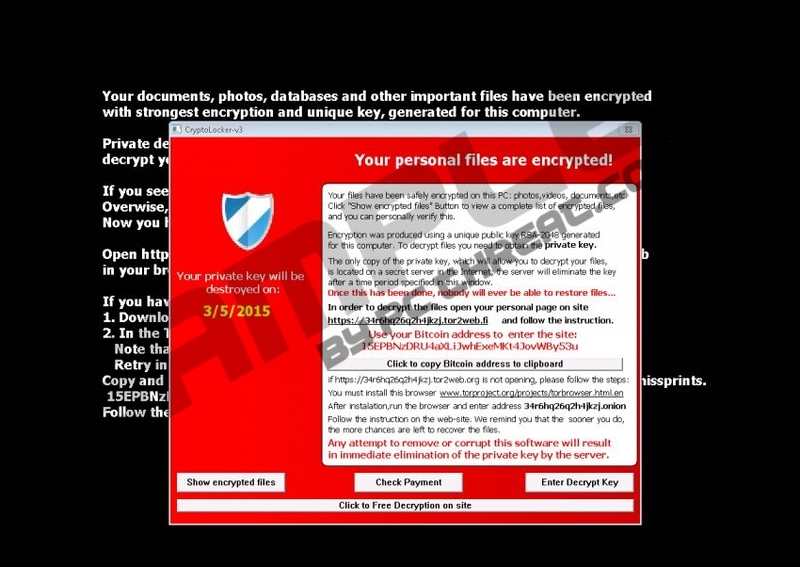 Of course, you should not forget to remove TeslaCrypt Ransomware first. The main targets of TeslaCrypt Ransomware are those systems which are unprotected; it means that there is no security tool installed on it. In addition, this infection might enter your system if you surf untrustworthy websites, download software from them, and click on various advertisements that offer to install a really “useful” program. In addition, TeslaCrypt Ransomware might have slithered onto your computer if you have opened some kind of spam email attachment. Keep in mind that it might be extremely difficult to remove malware, so if you want to protect your PC from malware, you should install an antimalware tool on the system and keep it always enabled. An antimalware tool will help you remove existing infections as well. According to the specialists at pcthreat.com, TeslaCrypt Ransomware temporarily kills such system utilities as Registry Editor, Task Manager, and cmd.exe; however, they recover soon, which means that you will be able to remove TeslaCrypt Ransomware rather easily. Actually, we do not recommend that you remove this ransomware manually because it is very difficult to do that. Luckily, a reliable automatic tool, such as SpyHunter, will be able to help you to delete this threat. You simply have to acquire it, install it on the system, and then launch the scanner in order to remove TeslaCrypt Ransomware together with other existing threats. Keep the tool enabled and it will not allow serious future infections to enter your system. Open your Internet Explorer, Google Chrome or Mozilla Firefox browser. Type in http://www.pcthreat.com/download-sph in the address box. Download SpyHunter, install it on the system, and then scan your PC to remove infection. Quick & tested solution for TeslaCrypt Ransomware removal.